OK. 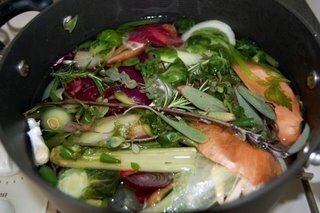 Vegetable broth. It’s one of the easiest, healthiest things you can make in your kitchen. 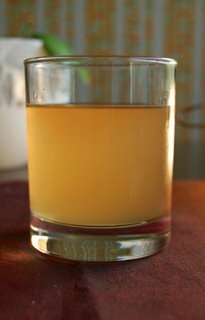 It reduces waste, tastes good, and can be used in any dish that calls for chicken broth and many that call for water. It’s free to make–you make it out of scraps you would throw away–and once you start making it, you’ll wonder why you ever spent money on canned broth. Here’s how I do it: When I start to get low on broth, I put a one-gallon plastic container in the freezer. Then I start putting all the vegetable parts in there that I would otherwise throw away. A couple of rules on this: I always make sure the vegetables are clean before I throw them in, I don’t use flavorless parts like garlic peels, and I never put anything that is rotting into the container. So what do I put in? Pretty much everything. That includes the ends of onions, the tops of celery, garlic slivers, wilting cabbage leaves, potato peels, stems from herbs, and so on. The only vegetable parts I have learned not to throw in are artichoke stems because they make the broth bitter. I would also avoid tomatoes, hot peppers, and mint. Otherwise, everything seems to enhance the broth. The plastic container fills up quickly. Soon, I have about three cups of vegetable parts. At that point, I make the broth. I get a large soup pot and fill it up with water. Then I dump the vegetables in, along with some fresh herbs (basil, rosemary, sage, etc. ), and garlic. I turn the stove on high, bring to a boil, lower the heat to medium, and let it simmer for an hour. After the hour is up, I taste the broth. By then, it’s usually the golden color we associate with broth. (This amazes me, by the way. The first time I tried this, I couldn’t believe that all these vegetable ends could make something so appealing.) At this point, I add quite a bit of salt–maybe a quarter cup? I’ll keep adjusting seasoning until it starts to taste good and savory. Next, strain the broth. Get a large bowl, put a colander on top, and dump out the broth into it. Then mash the vegetable parts in the colander with a potato masher to get any extra broth out of them. I throw out the vegetable parts away. What I have left is a nice, golden broth. This recipe makes 10-14 cups of broth. I usually divvy it up by 2 cup increments into separate plastic containers and freeze them. When I need some broth, I’ll either have one defrosting in the microwave while I prep, or I’ll keep one at a time in the fridge for easy access. I use it all the time in pasta sauces, soups, rice pilaf, etc. Cost of Dish: Vegetable ends: free, Herbs: free (from the garden), Water: free, Salt: ~$.10. In the Store: Cost of 8 10-oz cans of vegetable broth is $8 ($1/can X 8 ). Awesome post! If you were a composter, you could even compost the simmered veg scraps, and then it’d practically be negative waste. Thanks Smorgasbroad. I am actually going to start composting in the near future too. How long could you keep a small amount in the frig? Kathryn, the usual amount of time that you could keep broth in the fridge–a couple of days to a week.